Getting off the plane in Bangkok it hit me: the heat, the humidity and the culture. Our first day was lost to a blur of jet lag but the one thing that kept me alert was the culture difference and how foreign everything seemed. It was an exciting and unfamiliar feeling that I hadn’t felt since being in South Africa, but it was a feeling I welcomed with open arms. We had one full day of exploring Bangkok because our time in South East Asia was limited and we didn’t want to get bogged down in the city. We made the most of that one day by exploring the old city on foot, trying street food, being late for the palace, running down Khao San Road, getting lost, experiencing the water taxi and blowing our money at the Sky Bar when we finally turned up wearing the correct dress code. 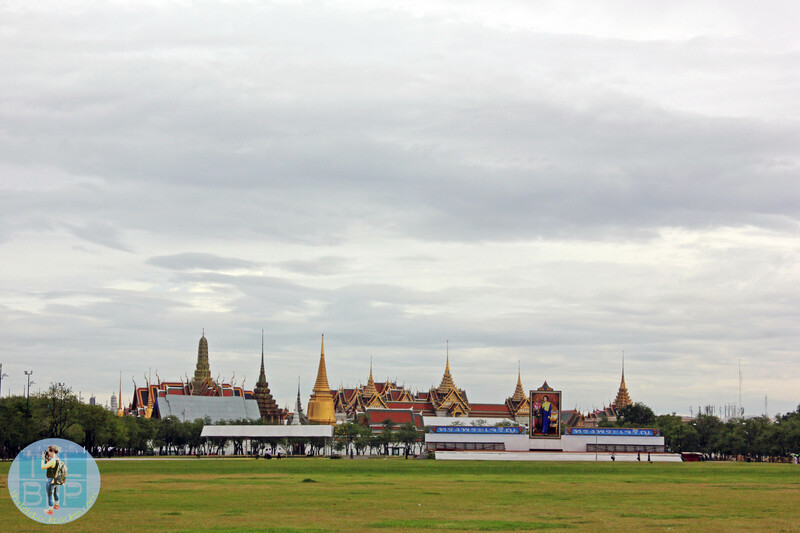 Bangkok is a city of two sides – the old and the new. It is split exactly as you would imagine: anything ‘old’ or traditional is in the old city and anything ‘western’ or modern is in the new city. We caught a train to the Hua Lamphong station and ignored every tuk-tuk driver for the next hour as we were determined to walk and explore this famous city. Getting around Bangkok on foot is not the easiest and we were convinced everyone was going to scam us. I was too afraid to ask anyone for directions. We walked around streets where the pavements were lined with street vendors and the buildings draped in thick coils of black power lines. After going off track again we ended up at the Rachawongse Pier and decided to take the water taxi up to Tha Chang – the nearest stop to the palace and handily located on the edge of a market. 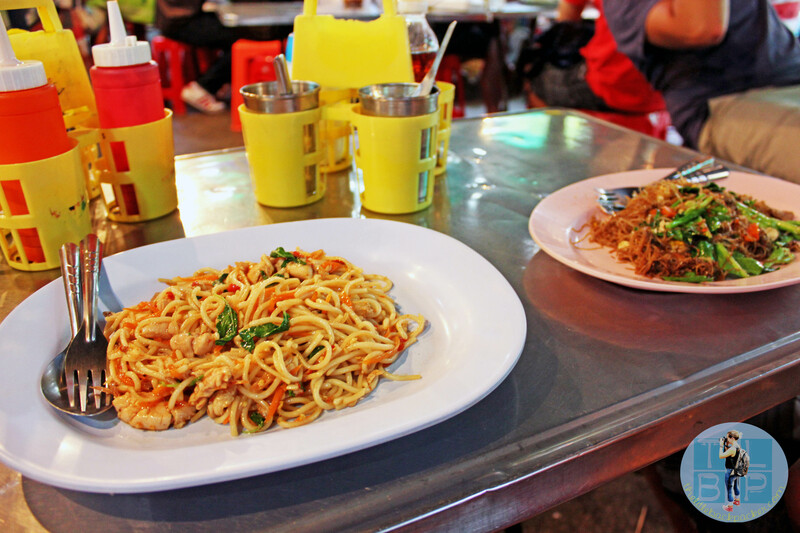 When we jumped off the water taxi at the Tha Chang pier we walked straight into a market and decided to try our first ever street food meal. I chose spaghetti chicken which had too much chilli for my liking and my boyfriend had egg noodles with chicken, again pretty spicy. It was beautifully served and cost a mere B40 each. We grabbed some watermelon for B20 from another street vendor as we made our way over to the palace. The palace sits in the middle of a square with a road running around the outside of it and only one entrance on the Na Phra Lan Rd. When we walked out of the market, instead of walking anti-clockwise and getting to the entrance quickly we walked clockwise around the entire perimeter of the palace. Eventually we found the entrance only to arrive at 3.35pm – this meant the palace was no longer letting people in for the day. Unable to believe we had walked all the way around the perimeter and now were too late for entry, we trudged off to Khao San Road. (If you are visiting the palace be sure to check the opening times and dress code). The infamous Khao San Road is exactly as you imagine it to be, the street is lined with market stalls and the bars tucked behind them. Every few steps someone will approach you and try to sell you something. I did a good job at avoiding this but I saw several people getting approached and stuck in to conversation with the stall owner. The trick was to look from afar, not make eye contact and walk fast. The hustle and bustle of the road kept it alive despite most of the bars being empty at 4pm. On the other hand, you got a very good feel as to what it would be like at night. 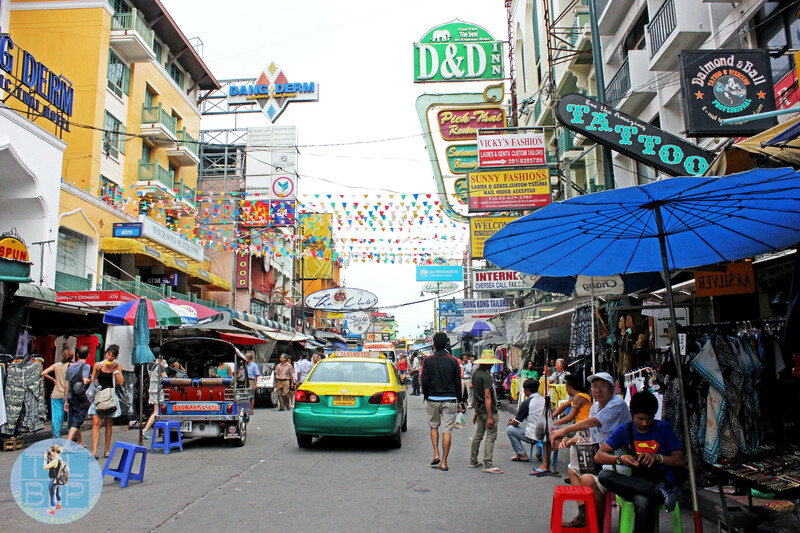 We quickly ticked of Khao San Road and wandered around the surrounding streets, which were full of market stalls, as we made our way back to the water taxi. 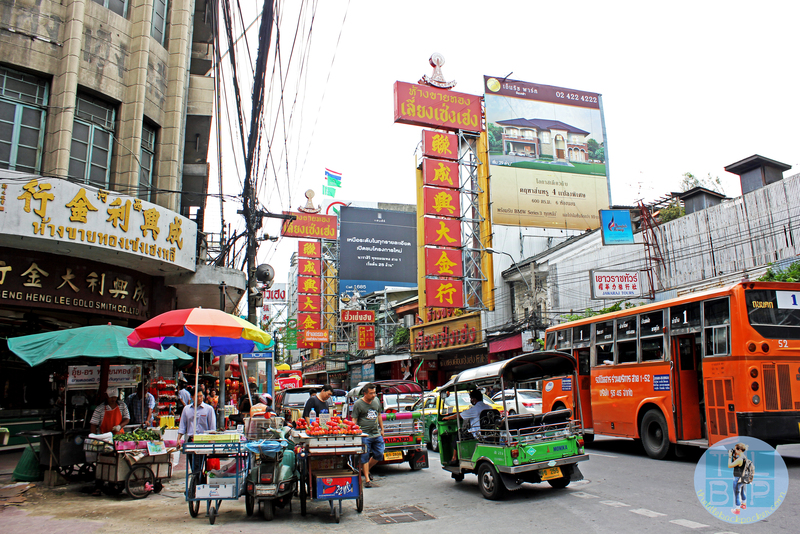 The transport links are great in Bangkok – they have a reliable and easy to navigate train service; however it doesn’t head in to the old city. Due to this we chose to use the water taxi to get back to our hostel in Silom. Having purchased a ticket previously at a kiosk, this time we just jumped straight on and hoped for the best. When we were asked to buy a ticket we were charged B12 each instead of B40, and this journey was even further… just a word of warning. On the walk back to the hostel we spotted the famous Sky Bar from Hangover 2 and made a mental note to return later. 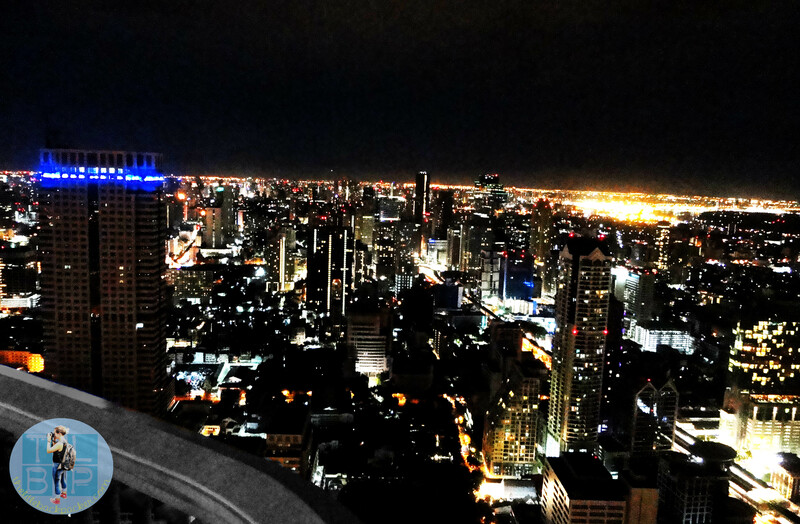 We headed out for the Sky Bar, stopping at Soi 20 to purchase some street food for the more expensive price of B200 each. The Sky Bar was a 15 minute walk from our hostel and we arrived only to be told we would have to go back and change as the bar does not allow open toed shoes or men in shorts. After walking all the way, we were pretty gutted and debated if we should return or not. Given we only had one night in Bangkok we chose to change and return. We were greeted by the same friendly girl and instantly shown upstairs. The view was incredible, and the bar every bit as fancy as I imagined. They had strict rules on where you could stand to take photos and if you stood in the wrong place someone would appear within seconds to usher you away. The one downside to the bar was the prices and the queuing – expect to pay western prices for all the cocktails, beers etc. and to be stood queuing for a drink, and then again to pay and receive your change or card back. On our way out we decided to check out the Breeze bar on the lower level of 52. This gave us views from the opposite side and was incredibly quiet compared to the Sky Bar. I was glad we visited both bars but they took a huge chunk out of our budget. Over our one full day in Bangkok I feel like we saw and did a lot; however if you have the time I would suggest spending at least 2 – 3 days exploring the city, if not more. We missed the floating markets, all the palaces/temples and didn’t have much of a chance to party! Nor did we actually ride in a tuk-tuk through this famous city. I would also imagine it is easy to get bogged down in the city so make sure you save time to explore more of Thailand than just Bangkok. This is by no means a complete list of what to do in Bangkok but it’s what we managed to complete in one day. 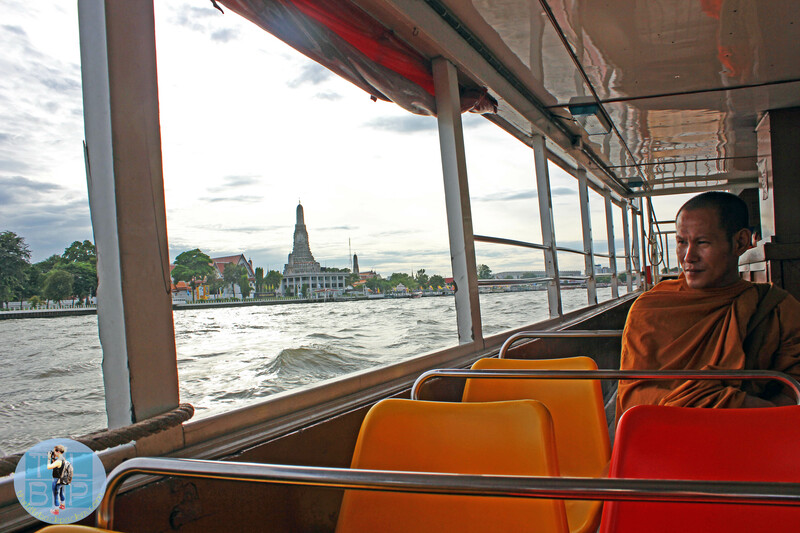 It was our introduction to Bangkok, having never travelled in Asia before. Need more information about travelling overland in Thailand or South East Asia including tips on overland border crossings and buses? Then check out my helpful post here or for more help planning your itinerary click here. Previous Post Was Maya Bay Worth The Visit?